One Hot Scot by Suzanne Enoch This is book 0.5 in her Scandalous Highlanders series. Julia Prentiss is wandering the woods trying to get away from the man that kidnapped her from her aunt's wedding. She comes across a man emerging from a lake and he is NAKED! She can't believe what she is seeing. She doesn't know whether to hide and ask the man for help. Duncan Lenox feels obligated to help when he comes across the stranded lady. He has been out trying to find when is killing his animals and staying at his cabin. Duncan takes Julia back to the cabin where they proceed to get to know each other. The kidnapper shows up at Duncan's cabin, but he puts them off. He later takes her to his home and proceeds to marry her. 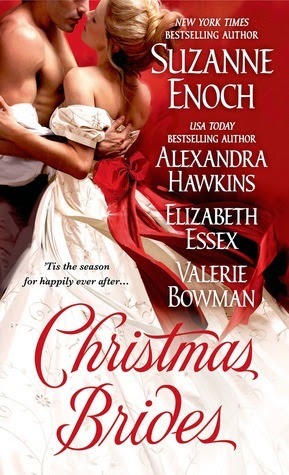 I am a HUGE Suzanne Enoch fan and have read almost all her books, but I really couldn't get into this book. I know that with a novella the action needs to go quickly, but to meet the man, jump into bed with him and then marry him within 24 hours is just a bit unbelievable. After writing this review last November, I did read the books that came after this (The Devil Wears Kilts and Rogue with a Brogue) and thoroughly enjoyed them. Lady Ellen can't believe that her father has increased her dowry so that there will be more men for her to choose from when she finally decides to take a husband. Her father is dying and he wants to see her settled before he does. Knowing that every fortune hunter that hears about it will be at her door, Ellen is not looking forward to the holiday parties her mother is throwing. Lord Derek Swainsbury wants to catch the killer of his sister. What better way than to act like he is courting the newest heiress as he knows the killer will go after her next? But what happens when he falls under her spell? Will she believe that he doesn't want her money? This is a very quick read. Hawkins did a good job of telling the story in such a short amount of words. I didn't feel like the love story was rushed or unbelievable. The connection between Ellen and Derek was almost instantaneous and fairly leapt off the page. This novella is a part of the Lords of Vice series featuring the sister of Lord Vanwright. I've not read any of those stories, but after reading this novella I will definitely be getting them to read in the future. This was book 3.5 in her Reckless Brides series. Lieutenant Ian Worth needs a bride and he will take just about anyone. In a rash moment, he told his father he was already married and now he needs to make it true. Ian runs into a shipmate and tells him what he is looking for in a wife - shy, undemanding and someone who will not mind his going off to sea. This shipmate just happens to have an unmarried daughter that fits Ian's needs. They arrange for Ian's perspective bride to come for a visit. When Anne Lesley arrives, Ian hardly even notices her. Later in the day, Anne overhears Ian talking about her (let's just say it wasn't nice) and decides to go for a walk. Ian joins her and they begin to get to know each other. Anne quickly gets over her shyness and Ian sees the potential that she has as a bride. Ian's father arrives and they must hide the fact that they are not married yet. They quickly fall in love and rush to get married with a special license. This is the first book I have read by Elizabeth Essex. I did like her style of writing and found myself laughing at some of the antics in the story (which is always good), but I really didn't care for the story itself. Anne was way too forgiving of Ian and the things she overheard him say. It would have taken a lot longer for him to worm his way into my heart! I've looked at the other books in the series and they look like they have promise. I will probably see if my library has copies of them to give this author a second chance. I probably would have given this book 2 stars, but I really enjoyed the character of Pinky! He saved the book in my opinion. Since reviewing this novella in July, I have read another book in the series. A Scandal to Remember was thoroughly enjoyable and I definitely want to go back and read the rest of the series. I think Essex is definitely better at writing full length novels rather than short stories. It Happened Under the Mistletoe by Valerie Bowman. Running from a marriage minded miss, Oliver Townsende dashes into the silver closet only to find another person hiding. Miss Cerian Blake is hiding from men seeking her hand only for the dowry she brings. The two of them concoct a plan to thwart their admirers, they act like they are interested in each other. What happens when their acting becomes all too real? I thoroughly enjoyed Bowman's short story. She got me to believe that these two could have fallen in love in such a short amount of time. This story is book 3.5 of the Secret Brides series and after reading this novella, I want to go read the rest of the series!! Thanks go to St. Martin's Press for a copy of the book in exchange of an honest review.